Or as low as $249.92 per month over 12 months. Apply Now. 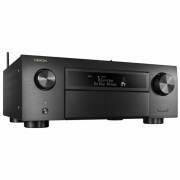 Denon AVRX6500H 11.2 channel supports Dolby Atmos, Auro-3D, and DTS:X for an enhanced home theater experience. It features 8 HDMI inputs and 3 HDMI outputs that support Dolby Vision, HDR10, HLG and 4K Ultra HD. Stream Spotify, Pandora, Tidal and more with HEOS built-in and control it with your voice through Amazon Alexa. Featuring a sophisticated power amplifier design, the AVR-X6500H delivers high-power performance at 140 watts per channel (8 ohms, 20Hz-20kHz, 0.05% THD). Low impedance drivers provide operational stability for a wide range of speakers and create balanced, tonal sound. 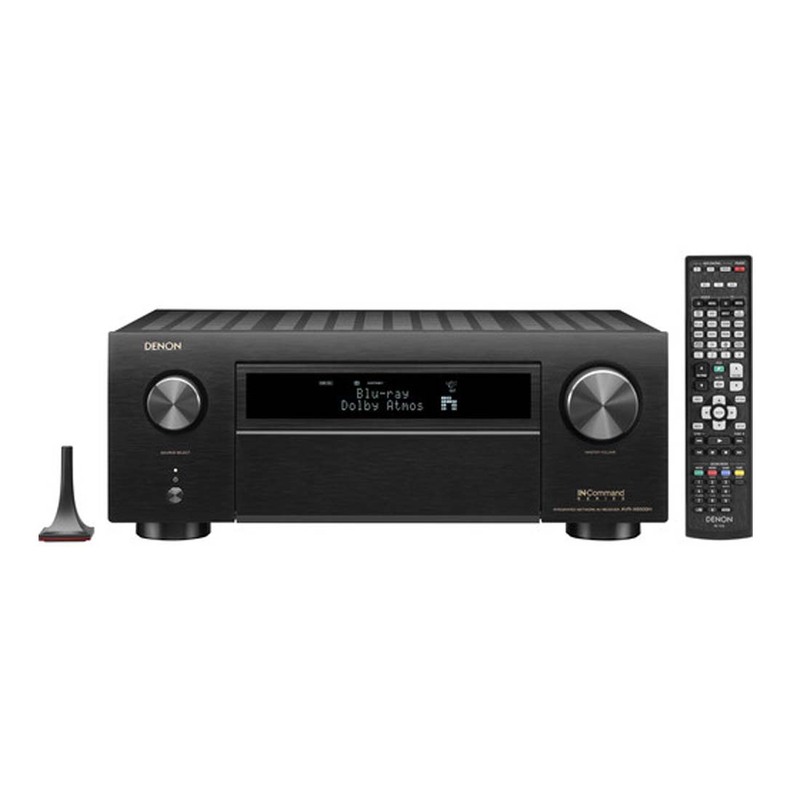 The AVR-X6500H features three-dimensional sound formats Dolby Atmos, DTS:X, DTS Virtual:X, and Auro-3D, plus an HDMI section with HDCP 2.2 support and advanced video processing with 4K scaling for HDMI sources and two 12V trigger outputs to connect external devices. Immerse yourself in multi-dimensional audio with Dolby Atmos, DTS:X, DTS Virtual:X, and Auro-3D. Set up Dolby Atmos with a 5.2.4 or 7.2.4 surround sound speaker system using Dolby Atmos elevation speakers, or dedicated overhead speakers, for the ultimate home theater experience. DTS:X and Neural:X give your movies, games, and music a realism unmatched by traditional 5.1 surround sound. DTS Virtual:X provides immersive audio without height channels, creating virtual height effects in a 5.1, 7.1 or 2.1 speaker arrangement. Auro-3D elevates the home theater experience to amazing new levels by delivering the excitement of three-dimensional sound for music, games, broadcast, and films while enhancing your existing audio-visual collection through the Auromatic upmixing engine. Control the AVR hands-free with Amazon Alexa and your voice. Adjust the volume, skip to the next track, switch inputs for your different media players, and more — “Just Ask.” Download the HEOS Home Entertainment Skill to enable Amazon Alexa voice commands for your AVR-X6500H, HEOS devices and other select Denon products. The latest HDMI specs for the best home theater experience. All eight HDMI inputs — and three HDMI outputs — feature HDCP 2.2 Support that lets you enjoy copy-protected content uninhibited. Watch movies and shows with 4K Ultra HD 60Hz video, 4:4:4 Pure Color sub-sampling, Dolby Vision, High Dynamic Range (HDR10), Hybrid Log-Gamma (HLG), eARC (enabled via firmware update) 21:9 video, 3D and BT.2020 passthrough support for exceptional color, clarity, and contrast. Certified by the Imaging Science Foundation, the AVR-X6500H features a full suite of video calibration controls (for use by an ISF technician), along with ISF Day and ISF Night video modes. 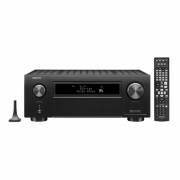 With the Denon AVR-X6500H, it’s possible to enjoy 7.1 channel surround sound in one room and a separate source or music stream in up-to two others for a total of 3 sources and 3 zones. Watch a movie in one room while another family member listens to music in a different zone without interruption. The AVR-X6500H supports High Dynamic Range (HDR10) video format, Dolby Vision and HLG (Hybrid Log-Gamma). Dolby Vision transforms the viewing experiences with astonishing brightness, contrast, and color. HLG offers HDR technology over broadcast content. In today’s custom install environment, it’s critical for integrators to provide quick, reliable assistance and service to their clients, even after the install is complete. To support this effort, the Denon INCommand series AVR-X6500H AV receiver features “ihiji Invision” and “Domotz Pro” remote system monitoring and management technology. These programs allow custom integrators to monitor the status of connected products and troubleshoot remotely from the office or on the go, radically reducing the time it takes to address the issue. The included AVR-X6500H Quick Start Guide provides simple, clear instructions for how to get started. Once you connect your TV to the AVR-X6500H via HDMI, the exclusive Denon Setup Assistant appears on your TV screen to walk you through setup, step-by-step. A row of color-coded speaker connections is laid out horizontally, making organizing and connecting speaker wires simple. The heart of your wireless network. 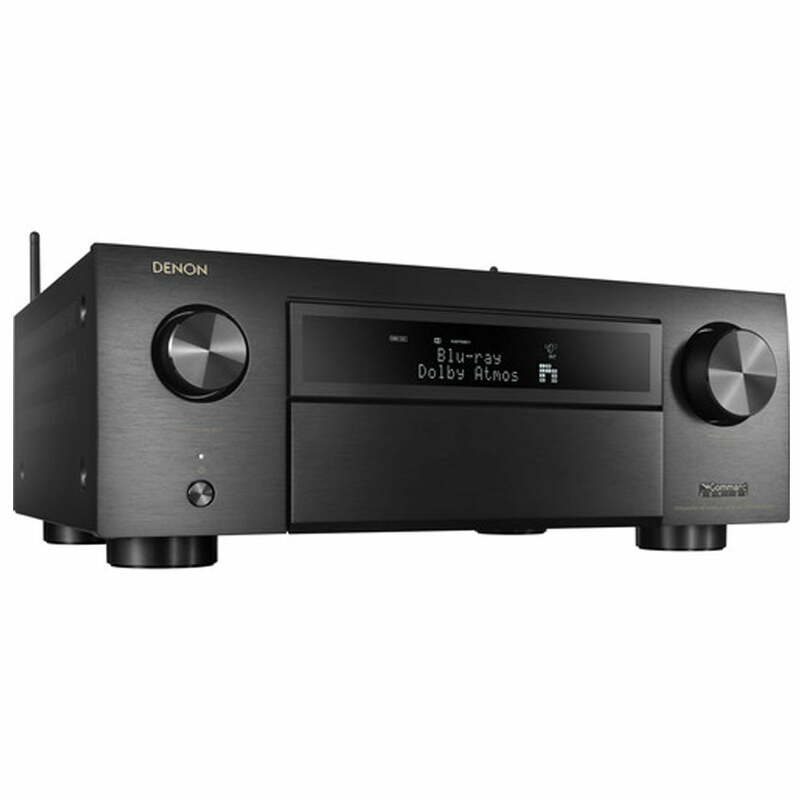 With Bluetooth and Wi-Fi wireless streaming connectivity, the Denon AVR-X6500H is equipped with an advanced dual antenna transceiver system for robust streaming, even in congested urban environments. Enjoy listening to your favorite audio content wirelessly from your smart devices. Enjoy your favorite music in any room of your home wirelessly with built-in HEOS technology. Play the same song in every room, or select a different song for each connected room — the choice is yours. Also works with Amazon Alexa providing cutting-edge voice control and incredible sound for all of your home entertainment. The AVR-X6500H easily guides you through the setup process to ensure the most accurate configuration. Optimize all settings for the best possible sound and video quality with your system from the get-go. The most advanced Audyssey MultEQ XT32 room measurement system provides the best sound in every room — and with the Audyssey MultEQ Editor app, go under the hood and set to your exact specifications. The Denon AVR-X6500H front panel features four Quick Select buttons that store your preferred audio settings for each source. 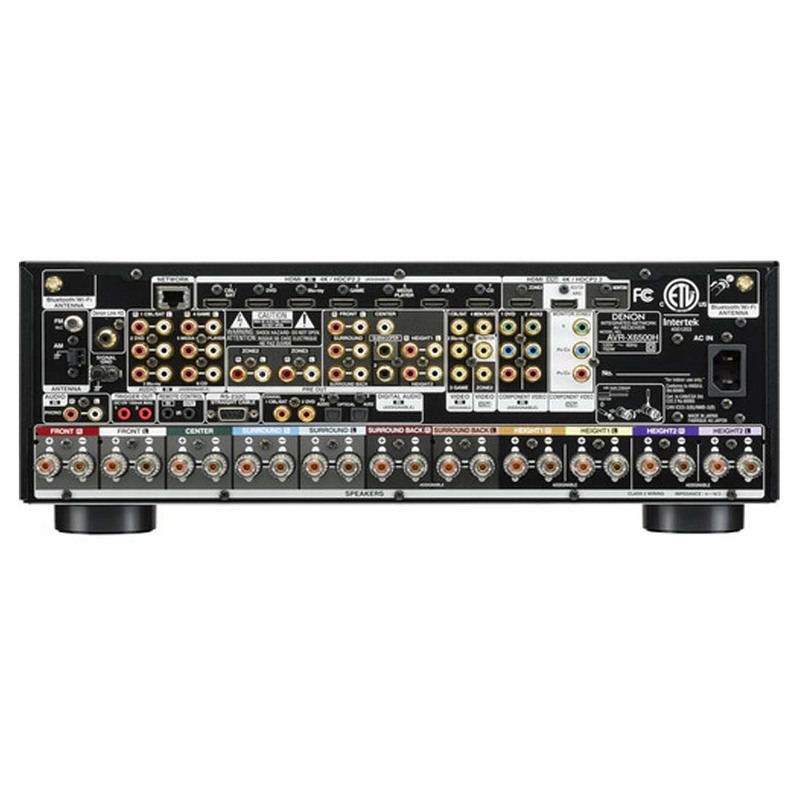 Switch between TV audio, Blu-Ray, media players, and more, and the AVR-X6500H adjusts the EQ settings to your preferences for that media source. Use the buttons on the front panel or opt for the same Quick Selects on the AVR remote for faster control. Better control in your back pocket. The free Denon AVR Remote for iOS and Android makes using the AVR-X6500H even easier — adjust volume, turn it on or off, mute the music, select a source or switch to HEOS. Download the free Denon AVR Remote app to your smartphone or tablet today. Incredible power for your music and movie needs. 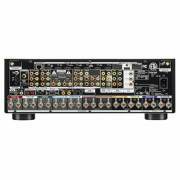 The AVR-X6500H includes an advanced DSP (Digital Signal Processor) chip for tremendous power processing. With four 400MHz DSP cores that are capable of processing over one billion computations per second, the AVR-X6500H supports the latest video, sound and processing needs.